Gov. Rick Snyder, Michigan First Lady Sue Snyder, and sexual assault survivors spoke with reporters during Monday’s Campus Sexual Assault Summit in Lansing. 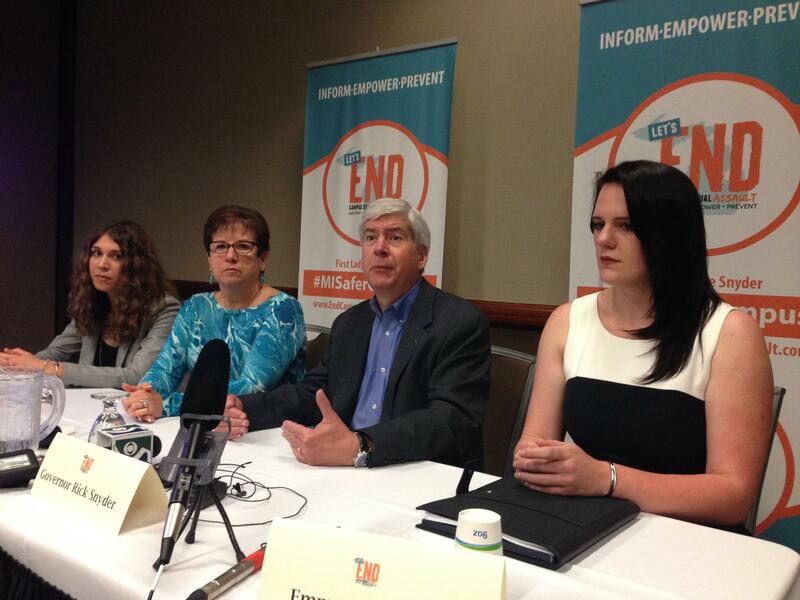 State officials touted the item at a summit in Lansing on preventing campus sexual assault. It was hosted by Gov. Rick Snyder and First Lady Sue Snyder. “Today is the day that we’re really going to take that first step forward. And we’re going to make Michigan a leader in solving this,” the first lady told reporters during the conference. Michigan State Police Director Col. Kriste Kibbey Etue admits the money won’t go very far. “But it’s a good start,” Etue told reporters. “And I think what we can look at is, what is the need out there? What are some of the innovative ideas that we could education and look toward prevention on our college campuses?" Three Michigan universities – Michigan State University, the University of Michigan, and Grand Valley State University – are under investigation by the U.S. Department of Education for how they’ve handled sexual assault claims. A number of state and federal policymakers at the conference say they’re reluctant to pass laws dictating how schools should handle those cases.